Hotels Vary in style and quality but are generally considered one of the welcome surprises for visitors. There is a variety of hotels in Bhutan, ranging from simple huts that cater to Bhutanese yak herders to Paro's fancy Olathang Hotel, which was built for royal guests. There is no International chain of hotels and not much imported hotel equipment; what you get is a Bhutanese version of what the tourists expect. In most cases, the facilities and service is good. 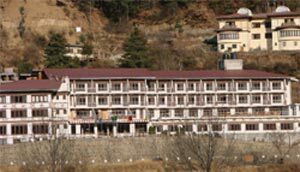 The Tourism Authority of Bhutan approves the hotels for the International Tourists.All government approved hotels are reasonably modern with running hot and cold water in Thimphu and Paro but less often further east in the remote areas. All hotels are equipped with telephone; fax machines with international dialing facilities. In Bhutan, Hotels and lodges are limited and vary in quality and standards. Since daily tariffs are linked to with the type of accommodation, visitors are advised to make timely reservations to reserve top class accommodation. In the list given below, hotels and lodges have been classified into categories (A), (B), and (C) according to the quality of Infrastructure facilities and services, as adjudged by the Department. To get a class or B class accommodation, one should send their tour confirmation in time so that we can reserve for you a class Hotels.